Kilmarnock climb into sixth place in the Scottish Premiership with a 2-0 win over Dundee at Rugby Park. Rory McKenzie opened the scoring from 18 yards when Steven Smith's shot ricocheted into his path. Marcus Haber passed up a huge chance to level when he sent his free header wide before the interval. And Souleymane Coulibaly thundered home his 10th goal of the season in all competitions from close-range to settle the game on 70 minutes. The Dundee goalkeeper Scott Bain showed he has confidence in his feet as well as his hands after he sidestepped Nathan Tyson having controlled a passback 10 yards off his goal line, but he got away with it with neat piece of skill. Not so neat was Cammy Kerr who was lucky just to receive a yellow card as punishment for a scything tackle on Jordan Jones. The Killie winger was in full flight when he was clattered by the Dundee wingback right in front of the home technical area. In the 18th minute the Kilmarnock supporters protested against director Michael Johnston. Their chants of "we want Johnston out" emphasised their desire for the club's company secretary to relinquish his place on the board. Within two minutes their chants turned to cheers as McKenzie gave Killie the lead. Smith's shot was blocked but fell at his team-mate's left foot. McKenzie's trickling effort had enough to beat Bain at his right-hand post. Dundee, unbeaten on their last five visits to Rugby Park, could have been level had Tom Hateley made a better connection to a Marcus Haber headed knock-down. He mishit his effort from close-range at the back post on the half hour mark. Moments later substitute Danny Williams, who had replaced James Vincent, saw his volley saved by Jamie MacDonald, who dived to his right. Tyson almost doubled Killie's lead when drive from 18 yards clipped the crossbar on its way over. At the other end Haber should have done better with a header which bounced wide, while Craig Wighton struck the side netting after a fine cutback from the left by Williams. Jones's powerful running on the left flank caused the Dundee defence no shortage of problems. His deliveries from corners also posed a threat and Will Boyle should have hit the target with a header from one of them. Just as Killie fans were striking up another chant against director Johnston their team made it 2-0. Jones was heavily involved with the ball in from the left and Coulibaly accepted the opportunity to shoot high into the net. Bain denied Tyson then McKenzie in the dying minutes, and the feet of MacDonald prevented Williams snatching a stoppage-time consolation. 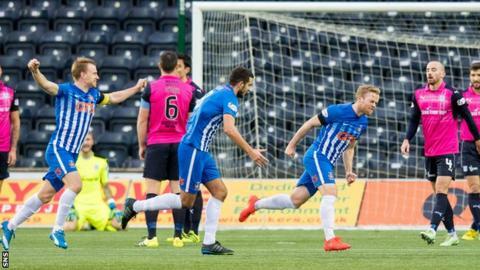 This, though, was a thoroughly deserved victory for Kilmarnock, their first in four matches. Kilmarnock manager Lee Clark: "I thought it was a dominant performance from start to finish. We created numerous chances. I thought to a man the players were fantastic, stuck to the game plan, we forced Dundee into a system change, albeit towards the end of the game. "It was a thoroughly deserved victory and it could've been by a bigger margin. "The games where we're playing teams in and around us, we have to have someone in goalscoring form. Souleymane does a lot of unseen hard work for us, but he's getting his rewards with the goals, the players appreciate what he's doing." Dundee manager Paul Hartley: "We weren't at it today. I felt Kilmarnock were better than us all over the pitch and it wasn't our best performance. "Haber has a chance at the back post, he can maybe do better, Williams has a chance but the keeper makes a good save, but overall we didn't really threaten their goal enough. "We didn't pass it well, we didn't get into the final third enough and we didn't get enough good balls into the box. "These are the games that are going to be vital for us - the league table from sixth down to 12th is so tight - so I think every point is vital. But we've got to regroup and go again." Match ends, Kilmarnock 2, Dundee 0. Second Half ends, Kilmarnock 2, Dundee 0. Attempt saved. Danny Williams (Dundee) right footed shot from very close range is saved in the centre of the goal. Substitution, Kilmarnock. Adam Frizzell replaces Jordan Jones. Souleymane Coulibaly (Kilmarnock) wins a free kick in the defensive half. Corner, Dundee. Conceded by Rory McKenzie. Attempt blocked. Darren O'Dea (Dundee) right footed shot from the centre of the box is blocked. Delay in match Nathan Tyson (Kilmarnock) because of an injury. Rory Loy (Dundee) wins a free kick on the left wing. Substitution, Dundee. Rory Loy replaces Kostadin Gadzhalov. Attempt saved. Rory McKenzie (Kilmarnock) right footed shot from the centre of the box is saved in the bottom right corner. Attempt saved. Nathan Tyson (Kilmarnock) left footed shot from the left side of the box is saved in the bottom left corner. Foul by Nathan Tyson (Kilmarnock). Julen Etxabeguren Leanizbarrutia (Dundee) wins a free kick on the left wing. Corner, Kilmarnock. Conceded by Darren O'Dea. Attempt saved. Steven Smith (Kilmarnock) right footed shot from outside the box is saved in the centre of the goal. Goal! Kilmarnock 2, Dundee 0. Souleymane Coulibaly (Kilmarnock) right footed shot from the centre of the box to the top right corner. Assisted by Steven Smith. Attempt missed. William Boyle (Kilmarnock) header from the centre of the box is close, but misses to the left. Corner, Kilmarnock. Conceded by Paul McGowan. Attempt saved. Jordan Jones (Kilmarnock) right footed shot from outside the box is saved in the top left corner. Attempt missed. Craig Wighton (Dundee) right footed shot from the centre of the box is close, but misses to the left. Attempt saved. Jordan Jones (Kilmarnock) right footed shot from outside the box is saved in the bottom right corner. Attempt missed. Kevin Holt (Dundee) header from the centre of the box misses to the left. Corner, Kilmarnock. Conceded by Cameron Kerr. Attempt blocked. Jordan Jones (Kilmarnock) right footed shot from the centre of the box is blocked.